Picture credit to: The Conversation. 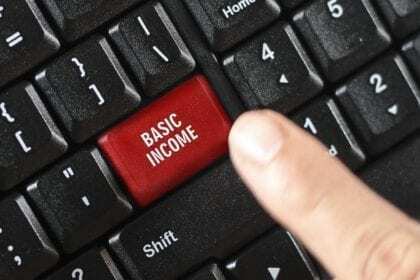 Approval of a universal basic income (UBI) has risen sharply in the United States. Karl Widerquist cites a 10-year-old poll showing that only 12% of Americans approved an UBI at that time. Now that number is 48%, according to a Gallup poll, conducted at the end of 2017 (on around 3000 adult US citizens). The cited poll also shows that women show more support than men (52 and 43% respectively), age strongly correlates with that support (54% for youngsters from 18 to 35 years-old down to 38% for people with more than 66 years of age), education level also has an influence (51% for people with less than a bachelor’s degree versus 42% for people with a bachelor’s degree or higher), as well as political orientation (28% for republican voters up to 65% for democratic voters). That same report finds that 73% of Americans think artificial intelligence (AI) will suppress more jobs than those it creates, which might in part justify these results, compared to those 10 years ago. However, Gallup’s poll shows that, for those in support of UBI, more than half (54%) wouldn’t be available to pay higher taxes in order to finance it. This is more evident in women (57%) then men (51%), and there is a strong educational effect: the higher the educational degree, the more willing supporters of UBI are to pay higher taxes to have it implemented (64% for those with a bachelor’s degree or higher versus 38% for those with less than a bachelor’s degree). Democrats are also more likely (55%) to pay higher taxes to get UBI than republicans (29%). In spite of this result, 80% of all supporters think companies benefitting from AI should pay more taxes (than they do now) in order to finance the UBI policy. This results for the United States are, in a way, similar to those from a recent survey in Finland, ran by researcher Ville-Veikko and professor Heikki Hiilamo. In the latter, support for UBI, based on the definition by Basic Income Earth Network (BIEN), was also very close to the 50% mark (51%), which clearly shows that the public remains divided when it comes to UBI. Not only in Finland, but also in the United States, even though the survey questions were posed somewhat differently in these two surveys (note 1). Note 1 – in Gallup’s survey the exact question was “Do you support or not support a universal basic income program as a way to help Americans who lose their jobs because of advances in artificial intelligence?”. In the Ville-Veikko and professor Heikki Hiilamo survey there was no reference to jobs or artificial intelligence. I am not surprised. I am one of them. I’m sick of seeing people here going hungry and homeless.